The skateboard wheels we stock are the skateboard wheels we ride. There are different types of skateboard wheels for different types of skateboarding. 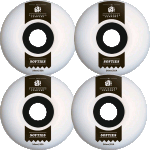 You might be a street skater so prefer a smaller 50mm to 54mm wheel in a nice hard urethane formula Like Bones STF Street tech formula or Spitfire F1 or the high performance Spitfire Formula Four wheels. If skate parks or bigger transitions skating is your game you could go for the larger SPF bones in 56mm and 58mm for a better roll speed and improved slide characteristics on the harder smoother park surfaces. If you like full core wheels the Rainskates, subLIME, Retro or Divine wheels might be your choice. If oldschool cruising, commuting or all-terrain performance is what your after we have softer Bones ATF, Powell Bombers, Spitfire Soft'Ds, and a range of Divine Parks and Wreck, Santa Cruz Slime Balls, and ABEC11 retro wheels up to 65mm so you can pump bomb carve slide and generally slash your way in any terrain.